BIM (Balancing Immunity) : a new approach to holistic well-being. 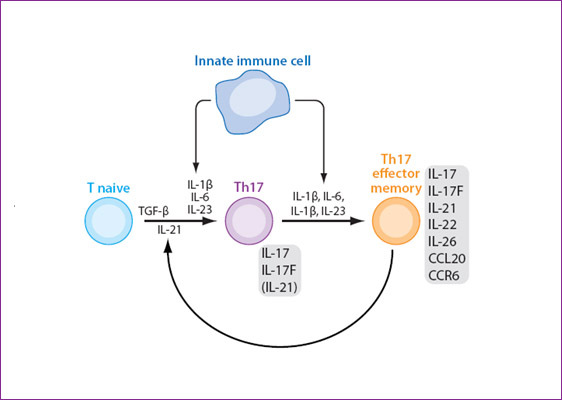 Differentiation of Th17 cells. Cytokines produced by antigen presenting cells (innate immune cells) induce the differentiation of na?ve T helper cells to Th17 cells which produce a set of cytokines including IL-17, IL-17F, IL-21 and IL-22. Modified from: Korn T, Bettelli E, Oukka M, Kuchroo VK. IL-17 and Th17 Cells. Annu Rev Immunol. 2009;27:485-517. Normal healthy subjects (n=5) were divided into 2 groups, receiving 4 tablets of BIM or placebo every day, respectively. Blood were collected using heparin as anti-coagulant at day 0 (before treatment) and day 15 (15 days after treatment). Peripheral blood mononuclear cells (PBMC) were isolated using Ficoll-Hypaque gradient centrifugation method. PBMC were in vitro activation using anti-CD3 monoclonal antibody (OKT3) or cultured without activation. During cultivation, anti-CD3 monoclonal antibodies bind to TCR-CD3 complex on T lymphocyte surface. The binding of the antibody to TCR-CD3 complex mimics the activation of T lymphocytes by antigen. Culture supernatants were collected after 24 hours of cultivation. Various cytokines (IFN- , IL-1b, IL-2, IL-4, IL-5, IL-6, IL-9, IL-10, IL-12, IL-13, IL-17A, IL-22, TNF-a) were determined by the Flow cytometric arrays assay (Flow Cytomix Multiplex; Bender; Austria). The cytokine levels were calculated as Stimulation index (SI: the ratio of cytokine levels between anti-CD3 activation and un-activation). The up-regulation of the SI value of the 2 subject groups were determined and compared. IFN-g and TNF- are the hallmark cytokines produced by the Th1 cells. To determine the effect of BIM product of Th1 cell response, we determined the effect of BIM on the production of IFN- and TNF- . Receiving BIM group strongly induced the production of IFN- and TNF- comparing to the placebo control group (Fig. 3). The up-regulation of IFN- and TNF- indicating that BIM product can activate the Th1 polarization in vivo. Upon activation, Th2 cells secrete cytokines IL-4, IL-5 and IL-13. The effect of BIM product on the Th2 cytokines were then determined. As shown in Figure 4A, no effect of BIM on IL-4 was observed. In our experiment, in fact, IL-4 could not be detected in culture supernatants of PBMC either in un-stimulation or anti-CD3 mAb stimulation conditions. In contrast, decreasing of IL-5 and IL-13 production was observed in subjects receiving BIM comparing to the control group (Fig. 4 B and C). In addition to IL-4, IL-5 and IL-13, the cytokines IL-1, IL-6 and IL-10 were described as the Th2 cytokines. We then determined the effect of BIM on these cytokines. It was found that the BIM product has no effect on either IL-1, IL-6 and IL-10 (Fig. 5 A, B and C). These results indicated that BIM product has no effect on the induction of Th2 cells activity and confirm the previous results that BIM stimulate the Th1 pathway. The effect of BIM on Th17 cell induction was determined. As shown in Figure 6A and B, BIM product showed strongly induction Th17 cytokines including IL-17 and IL-22. Particularly, we observed very strong induction of Th17 cytokine production by BIM (Fig. 6). Our results indicated that the BIM product has robustly in vivo effect on Th17 cell activation.